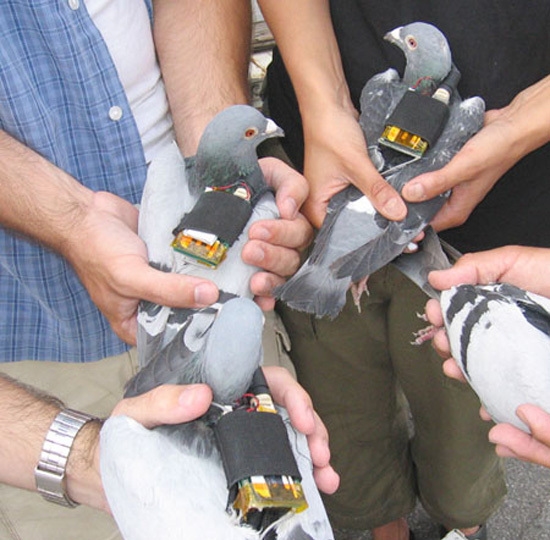 So rather than remaining an urban nuisance, pigeons coalesce into a network of ambient monitoring devices. Which makes one wonder what other sort of urban animals can be recruited as bloggers, letting us know the particulars of their day, uploading mobile cam photos to Flickr of street scenes or rush hour traffic on the freeways or that four-alarm fire in downtown, all done in real-time. Can we soon expect stray cats and dogs, sewer rats, and cockroaches to be thought of as critical infrastructure rather than something to be designed out of the landscape? Check here for the keepin' it real Pigeon Blog. The online diary of a London Pigeon no less. A pigeon called Brisn. Once in a while I remember Greg Bear's "Blood Music", and the thought of those unstoppable germs that numb their hosts with "violin music" makes me * :-S *... Lets just hope the research does not involve GPS-equipped bacteria, hehe. See the Garmin that made it to ConsumerSearch's top selection for 2007. More of the GPS review, whether auto or handheld.